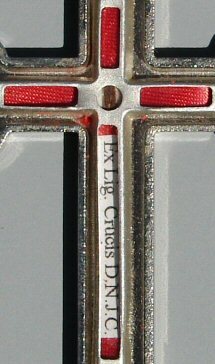 We Adore the O Christ, and we bless Thee. 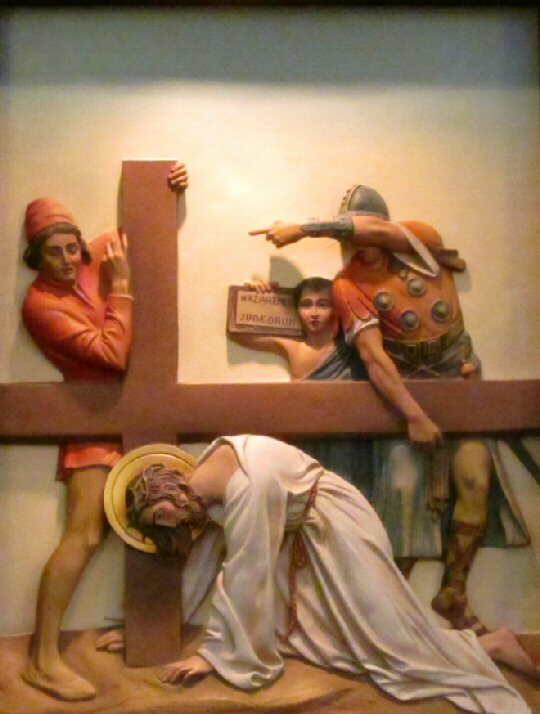 Because by Thy holy cross you have redeemed the world. 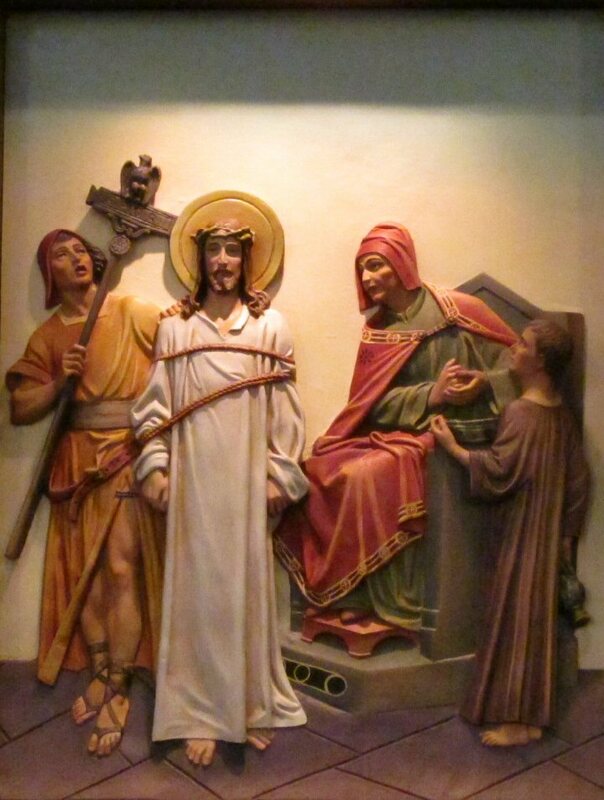 Consider how Pilate condemned the innocent Jesus to death, and how my Redeemer submitted to this sentence, to free me from the sentence of everlasting death. 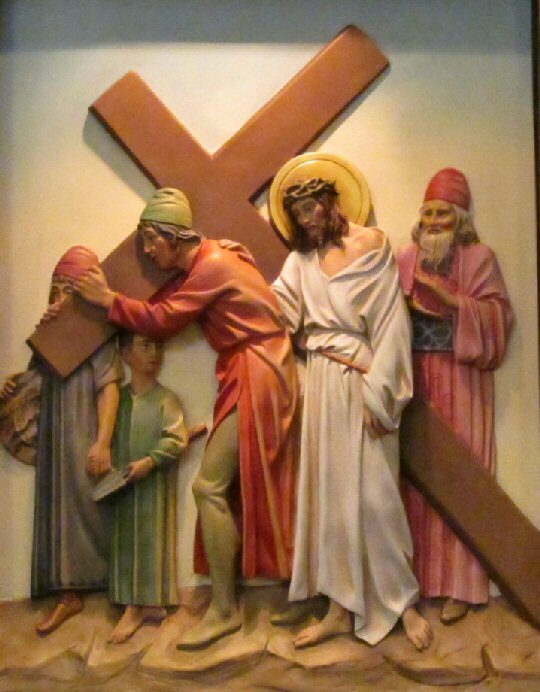 Consider how Jesus took the cross upon His shoulders, which my many sins made so heavy. 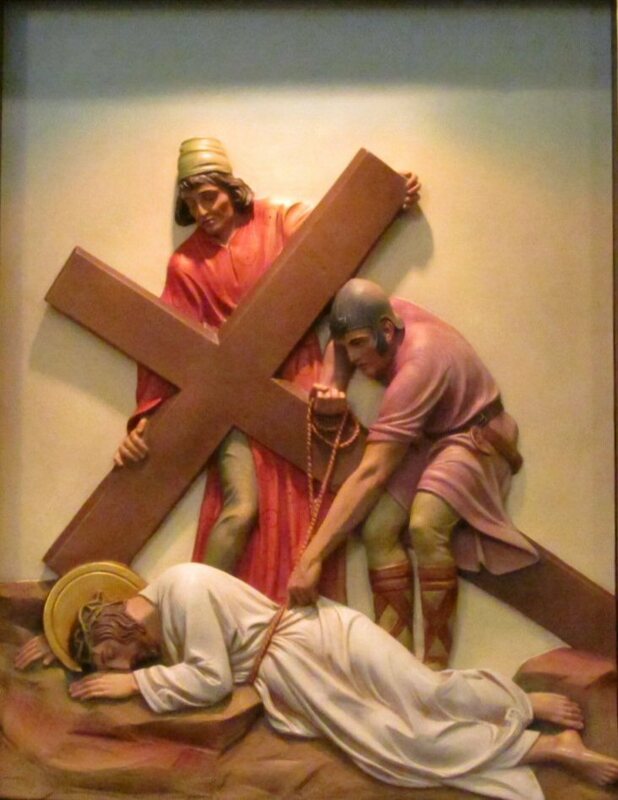 Consider how Jesus, overcome by weariness and pain, fell to the ground under the weight of the cross. 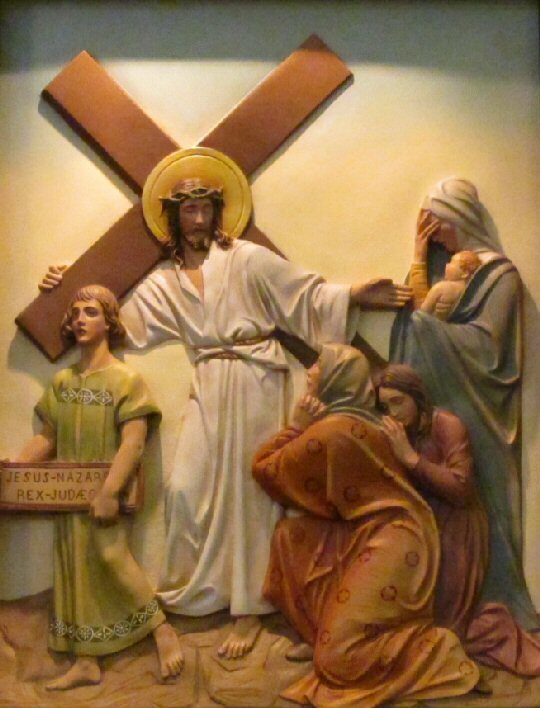 Consider the anguish which filled the hearts of Jesus and Mary at this sorrowful meeting. It is my sin which caused the Son and the Mother this pain. 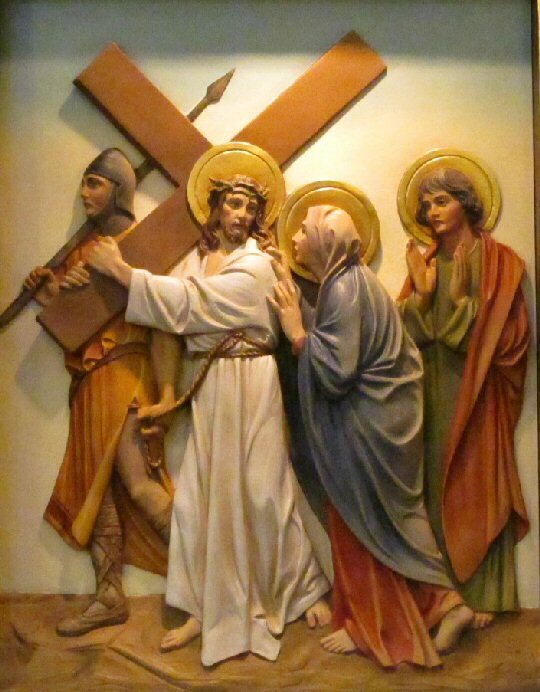 Consider how His enemies, seeing that he was no longer able to drag his cross, compelled Simon of Cyrene to carry it after him. 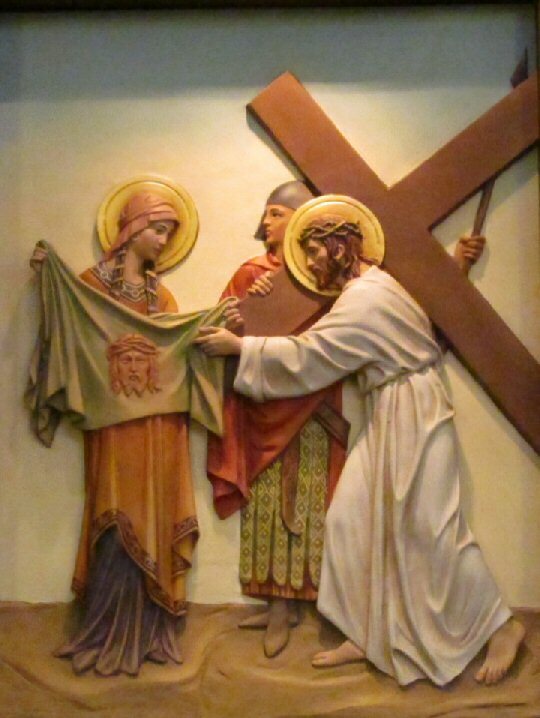 Consider how this woman tried to lessen the sufferings of Jesus, and how he rewarded her by leaving the print of His sacred face on the towel she had in her hands. 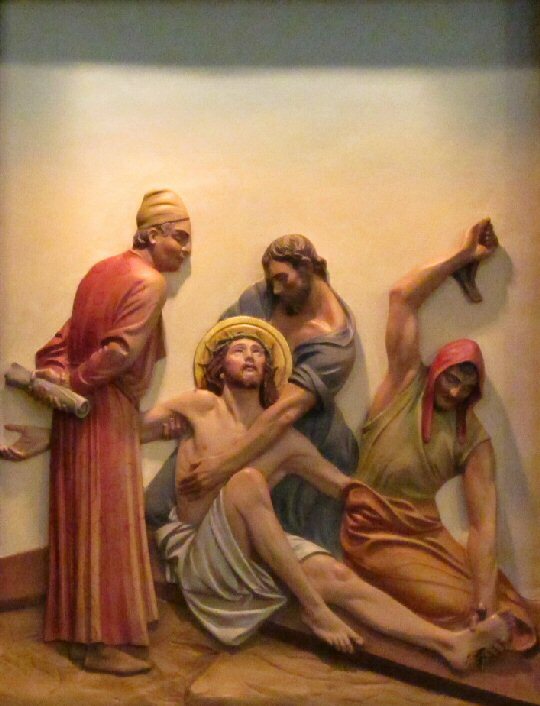 Consider the sufferings Jesus endures in this second fall. I have been the cause of them, by my frequent relapses into sin. 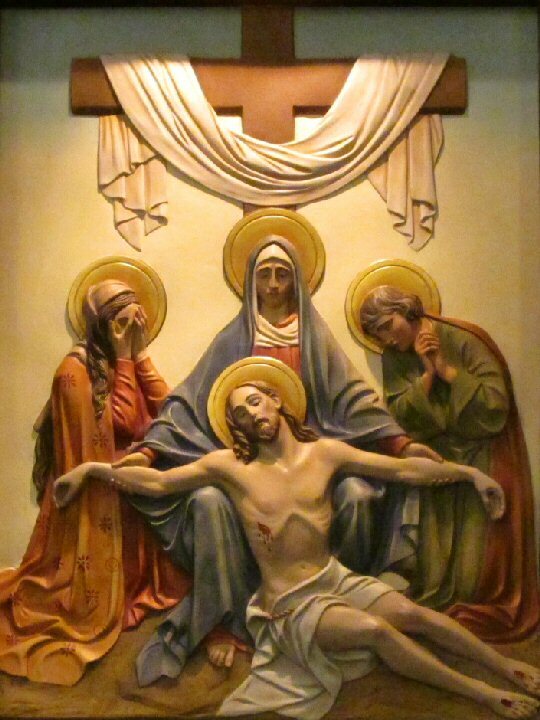 Consider how Jesus exhorts these women to weep, not for Him, but for themselves; to teach me to weep more for my sins than for His sufferings. 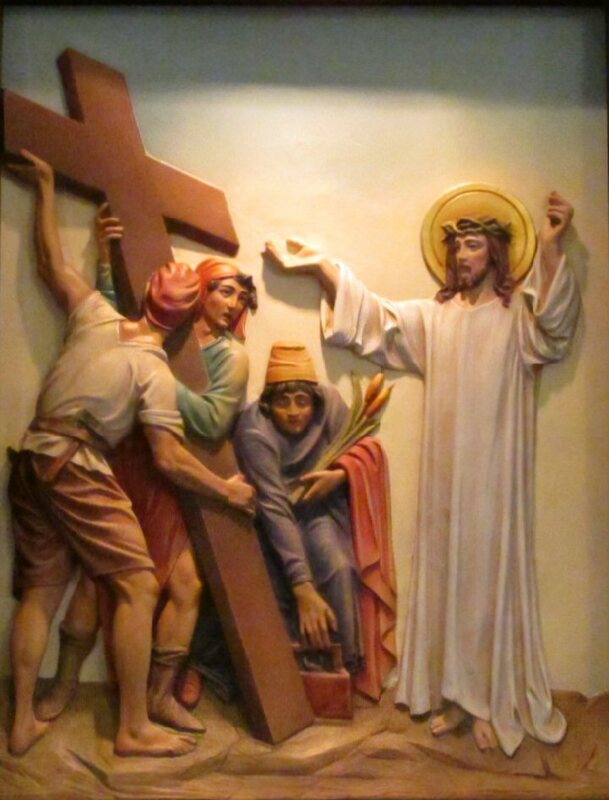 Consider how Jesus falls the third time, enduring excruciating pain, to atone for my obstinacy in continually committing new sins. 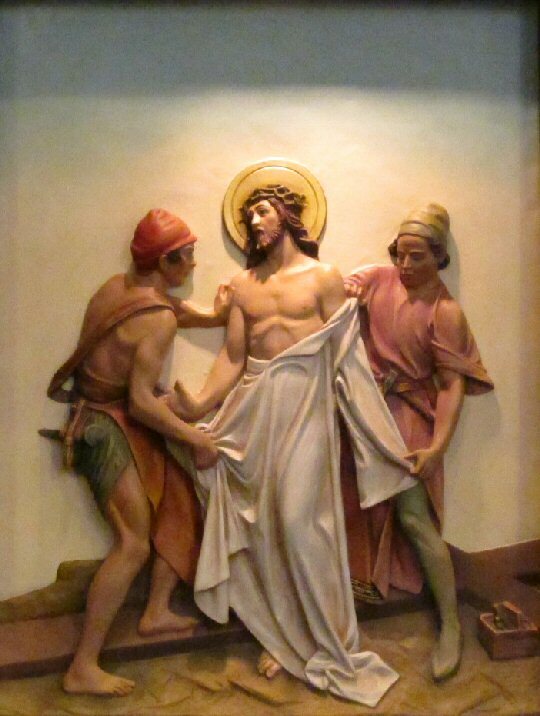 Consider the shame Jesus endured in being stripped of his garments, and the bitterness of the wine mixed with myrrh and gall, which they caused Him to drink. In this He atoned for my immodesty and my intemperance in eating and drinking. 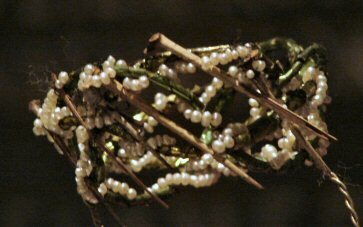 Consider the dreadful suffering Jesus endured, when His enemies stretched His bleeding body and fastened it to the cross with nails through His sacred hands and feet. 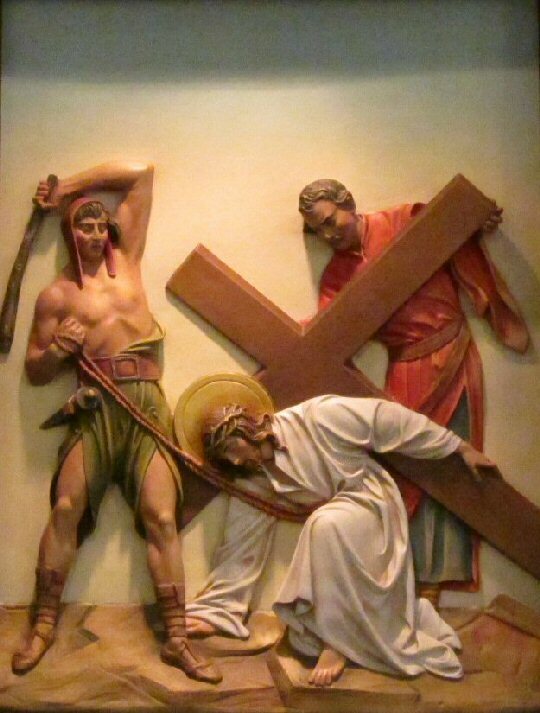 Consider how Jesus, after three hours of agony, dies on the cross for my salvation. 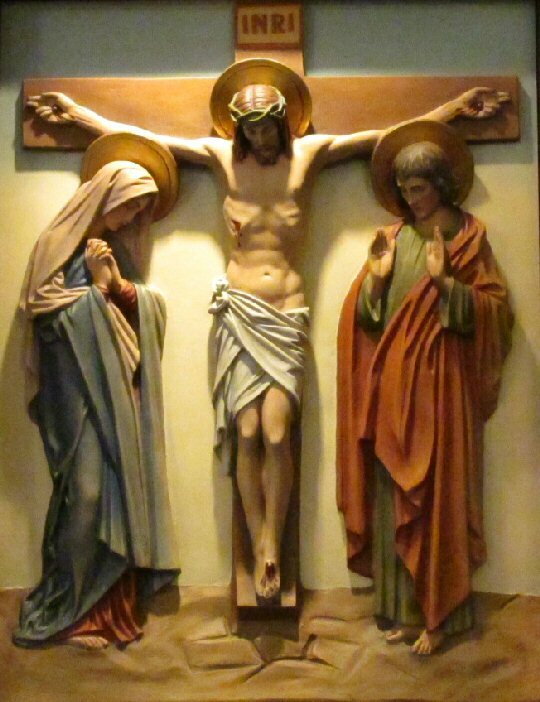 Consider the grief of the Mother of God when she received in her arms the body of her divine son, all pale, covered with blood, and void of life. 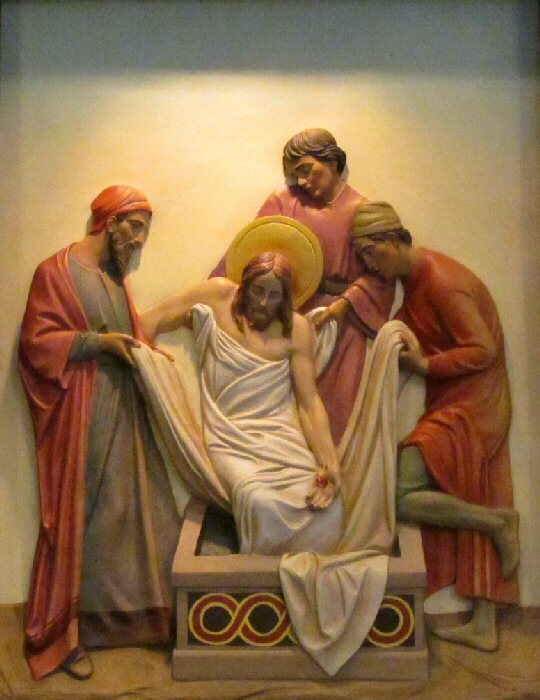 Consider how the most sacred body of Jesus was laid, with the greatest reverence, in the new grave prepared for it.